At Insider Monkey, we pore over the filings of nearly 750 top investment firms every quarter, a process we have now completed for the latest reporting period. The data we’ve gathered as a result gives us access to a wealth of collective knowledge based on these firms’ portfolio holdings as of December 31. In this article, we will use that wealth of knowledge to determine whether or not CenterPoint Energy, Inc. (NYSE:CNP) makes for a good investment right now. CenterPoint Energy, Inc. (NYSE:CNP) investors should pay attention to a decrease in enthusiasm from smart money lately. 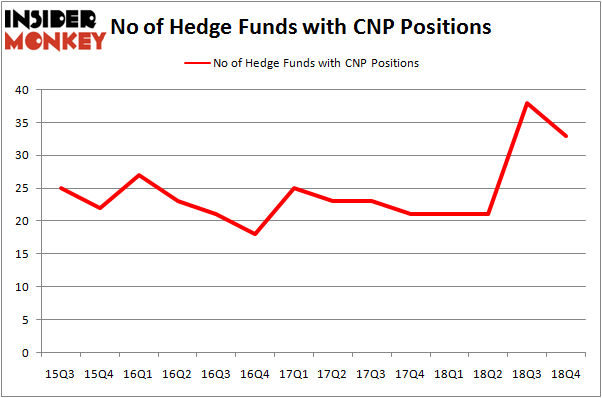 CNP was in 33 hedge funds’ portfolios at the end of December. There were 38 hedge funds in our database with CNP positions at the end of the previous quarter. Our calculations also showed that CNP isn’t among the 30 most popular stocks among hedge funds. We’re going to analyze the new hedge fund action surrounding CenterPoint Energy, Inc. (NYSE:CNP). 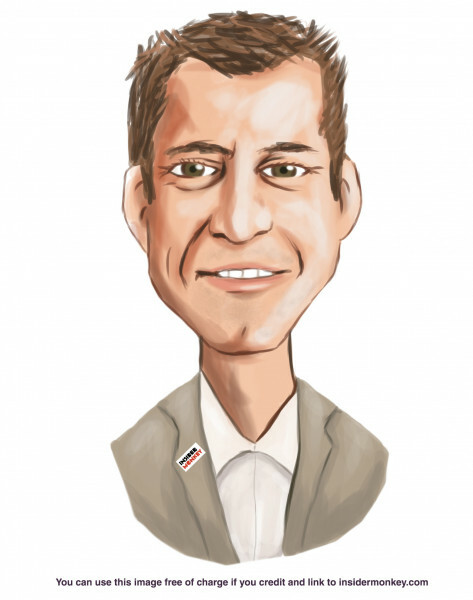 At the end of the fourth quarter, a total of 33 of the hedge funds tracked by Insider Monkey were bullish on this stock, a change of -13% from the previous quarter. On the other hand, there were a total of 21 hedge funds with a bullish position in CNP a year ago. So, let’s see which hedge funds were among the top holders of the stock and which hedge funds were making big moves. When looking at the institutional investors followed by Insider Monkey, Millennium Management, managed by Israel Englander, holds the most valuable position in CenterPoint Energy, Inc. (NYSE:CNP). Millennium Management has a $242.6 million position in the stock, comprising 0.4% of its 13F portfolio. The second most bullish fund manager is Citadel Investment Group, led by Ken Griffin, holding a $211.5 million position; the fund has 0.1% of its 13F portfolio invested in the stock. Remaining professional money managers that hold long positions contain Noam Gottesman’s GLG Partners, Phill Gross and Robert Atchinson’s Adage Capital Management and Cliff Asness’s AQR Capital Management. Due to the fact that CenterPoint Energy, Inc. (NYSE:CNP) has faced declining sentiment from the entirety of the hedge funds we track, it’s safe to say that there is a sect of money managers that slashed their entire stakes by the end of the third quarter. It’s worth mentioning that Benjamin A. Smith’s Laurion Capital Management cut the largest position of the 700 funds followed by Insider Monkey, comprising an estimated $33.3 million in stock, and Andrew Feldstein and Stephen Siderow’s Blue Mountain Capital was right behind this move, as the fund cut about $17.5 million worth. These bearish behaviors are important to note, as total hedge fund interest dropped by 5 funds by the end of the third quarter. Let’s now review hedge fund activity in other stocks similar to CenterPoint Energy, Inc. (NYSE:CNP). We will take a look at Mylan N.V. (NASDAQ:MYL), Genuine Parts Company (NYSE:GPC), Maxim Integrated Products Inc. (NASDAQ:MXIM), and CMS Energy Corporation (NYSE:CMS). This group of stocks’ market values are closest to CNP’s market value. As you can see these stocks had an average of 29 hedge funds with bullish positions and the average amount invested in these stocks was $842 million. That figure was $1425 million in CNP’s case. Mylan N.V. (NASDAQ:MYL) is the most popular stock in this table. On the other hand CMS Energy Corporation (NYSE:CMS) is the least popular one with only 21 bullish hedge fund positions. CenterPoint Energy, Inc. (NYSE:CNP) is not the most popular stock in this group but hedge fund interest is still above average. This is a slightly positive signal but we’d rather spend our time researching stocks that hedge funds are piling on. Our calculations showed that top 15 most popular stocks among hedge funds returned 19.7% through March 15th and outperformed the S&P 500 ETF (SPY) by 6.6 percentage points. Unfortunately CNP wasn’t in this group. Hedge funds that bet on CNP were disappointed as the stock returned 10.2% and underperformed the market. If you are interested in investing in large cap stocks, you should check out the top 15 hedge fund stocks as 13 of these outperformed the market.